Wow! You sure have nice people in your building! You also have nice insects. Our insects on this side of the island wait for NOBODY! Remember the termite spray with the flexible tube and the pointed metal nozzles to stick into holes in wood? Kay- the goal is to get rid of insects one by one, while reducing my pesticide footprint for the benefit of the planet. 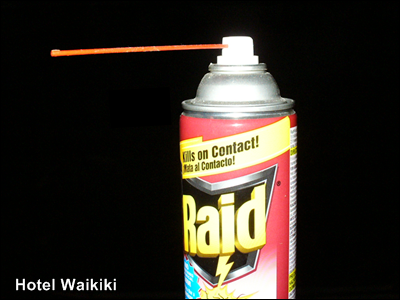 Nate- I actually tried the WD-40 nozzle, but they have a new design with a trigger mechanism that has reverse connections to the spray can, purposedly designed that way so people don't steal the the nozzles from the WD-40 cans on the store shelve. And yea, that termite spray was canned by a local company I think. Oh, I've definitely had that lottery feeling before. And I'm surprised that elevator arm dance has never made it to an episode of Seinfeld. In our Seattle condo elevator the texting youngsters seem very put out to have to share space with us wrinklies. The older people usually have dogs they are taking for walks, so we chat about dogs. owner- and how about the people who try to quickly squeeze into the elevator at the lobby stop before you even begin to take a step out. Cannot be a race becaue we're going in opposite directions. Hattie- there is elevator etiquette and there are people who should use the stairwells for the greater good.